In last month’s 2-2 draw with Norwich, Sharp re-enacted a finishing move made by famous Foley’s WWE character Mankind when he pulled out a sock puppet in a nod to Foley’s ‘Mr Socko’. Foley was thrilled by Sharp’s celebration, describing the striker as his favourite footballer of all time after seeing it trending on social media. 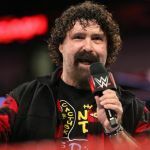 And the WWE legend has since accepted an invitation to watch the Blades play at Brammall Lane, confirming via his Twitter account that he will attend the club’s Sky Bet Championship clash with Brentford on May 12.